The Predator is set to return for a stop-motion holiday special and the trailer reveals that Christmas is going to be bloody this year. Shane Black's take on the franchise is about to hit Blu-ray on December 18th, and the stop-motion special will air the next day, December 19th during Comedy Central's Bojack Horseman at 10:30PM. 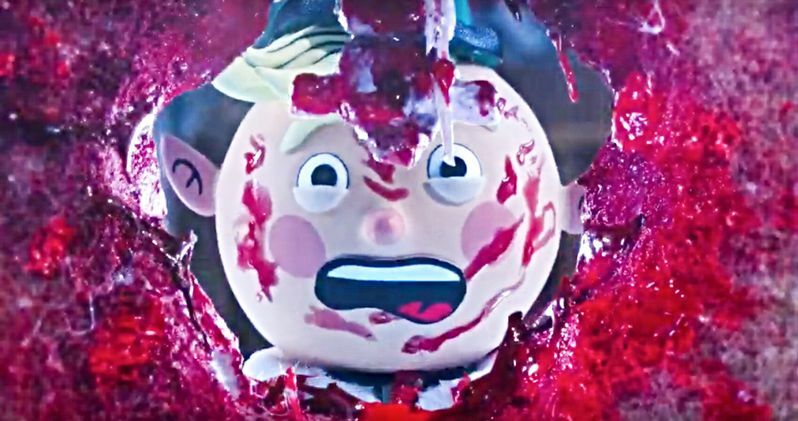 While Black's movie was pretty much torn apart by fans of the franchise and critics, The Predator holiday special looks like it will be better received. A first look at the stop-motion animated holiday special featuring The Predator features the alien in hiding as he hunts his most formidable foe yet - Santa and his reindeer. However, the trailer reveals that there are going to be casualties of the reindeer variety and there will be blood, lots of it. So, consider yourself warned because this stop-motion animation holiday special isn't messing around. There's no word on how long it will be, but we're hoping it will be at least in the five-minute range since it's airing during Bojack Horseman. The Predator holiday special contains classic-looking stop-motion animation with a pretty cute take on one of Santa's elves and Blitzen. The reindeer protects the elf, only to get blown away by the alien, leaving blood all over everywhere. For marketing a Blu-ray, this is a really great idea and is pretty similar to what The LEGO Movie 2 did with their recent holiday short, which is an innovative way to promote the upcoming sequel. That being said, the tone of both specials could not be any more different from each other in terms of holiday cheer. Santa wasn't revealed in The Predator holiday special trailer, but we're hoping that he'll hop into the Predator Killer suit from the end of Shane Black's movie. It will be mutually beneficial for the movie and the special, but it will mainly help Black's movie by showing an actual use for the suit, which seemingly popped up out of nowhere at the end. Black had originally planned on making a sequel, but that doesn't look like that's going to happen any time soon, so now would be an excellent time to arm Santa with the Predator Killer suit. Even though The Predator holiday special airs next week, it seems like it's too long to wait after seeing the brief trailer. Who knows, maybe we'll end up getting an annual special starring the aliens as they hunt down other iconic Christmas characters. Perhaps they can go after Buddy the Elf next or maybe bring in some friends from the Alien franchise as well. We already have Die Hard and Gremlins for the holiday season, so it's nice to add another 80s icon joining in on the fun. Let's hope that this is just the first of many holiday specials for the hunters. You can watch The Predator holiday special trailer below, thanks to the Fox Movies.